You may have noticed our analogy between spices and colors: Spices can play a hidden, a dominant or a complementary role in a meal. 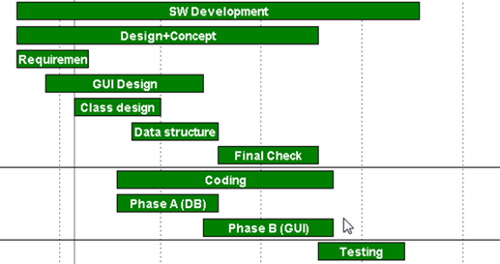 Similarly, there are also different functions that colors can take in a Gantt chart. Typically, we started differentiating between (a) the role of colors to determine the look and feel of a Gantt chart, (b) the role of colors to define the semantics and (c) the role of colors to provide intelligence to a Gantt chart. With this blog post, we want to shed some light on (a) by giving you four concrete tips. It goes without a saying that you should pay attention to achieve an esthetic look of your Gantt chart. This will definitively help increasing the user’s acceptance of your Gantt charts. Virtually nobody likes to work with something that he perceives as ugly. Please: make your Gantt charts beautiful! Both tools will allow you to find color schemes by using different rules of chromatics. We recommend to use the resulting color sets to tint all main diagram elements – in particular the table header and body, the timescale, and the bars. Although it seems trivial, we have seen many Gantt charts where we wished somebody would have remembered this triviality. MAKE SURE THAT YOUR USERS CAN READ ALL TEXTS EASILY. Honestly: Our Gantt chart control offers full horse-power to work with color gradients. Sometimes, we feel that this is a powerful feature but like chili. If you use it too much, the Gantt chart becomes really unenjoyably. inside a chart are colored by gradients it can result in an unclear look and distract from the main aspects of the chart. Also, keep in mind that your users are influenced by what is happening on their mobile devices: the current trend is flat tiled buttons and icons. Hence, only use color gradients in a very selective way. If the gradient blends from light over dark and again back to light this gives the impression of a concave surface. In contrast, using gradients from dark over light to dark will result in a convex surface. Mostly it is the convex look which appears to be suitable. Also: beware of unnatural looks. It is a daily user experience that objects are lighted from the top (think about the sunlight or the lighting in your office). Therefore, vertical gradients from dark to bright may appear in some way wrong or confusing. In any case do not mix both variants. Only few Gantt charts suffer from a lack of data ;-). The more data you have to display in a Gantt chart, the harder it gets for the user to relate the bar in the graphic part of the Gantt chart to the respective information in the table part. A good way to cope with this is to introduce alternating row background colors. As an alternative, you can also define that only the rows of the selected nodes are dynamically colored. This is a standard feature of our Gantt chart controls. What kind of best practices do you apply when it comes to coloring your Gantt charts? Please share with us in the comments.